Chicken Maker: NEW PROJECT - A.
I'm starting a new project. It is going to last until it is done. I don't know how long it'll take but I'm in no hurry to finish it. This is the first of the twenty-six parts. 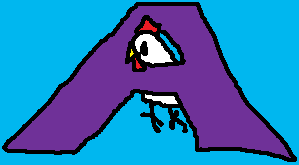 The new series is of course Alphabet of Chicken. Today we have A.
I like how A. came out. The chicken's got a nice dangling look to it. Being that I have synesthesia (I perceive letters to be inherently colored) this disturbs me a great deal.. It should be red!!! I like the chicken though :) I always like the chickens. i had this when i was a kid, not so much now. i do have memories of it. the number 5 is fuschia. fours were my favorite, a bright spring green with a kind of a yellowish haze. ergo my favorite 4 necklace. people ask about it sometimes and then give me the scooby-doo look when i explain it. synesthesia is a completely foreign concept if your brain isn't wired that way. oh and i counted stairs too. still do at times when i am stressed out. somehow it helps talk the freaked-out brain off the ledge a bit, i guess. hell, my cat has major ocd.